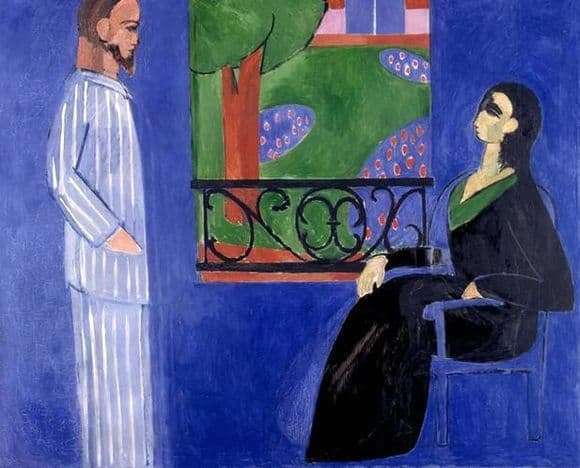 At first it may seem that Matisse portrays his own banal scene that can occur on any given day. We see the husband and wife talking in the morning. In the characters you can guess the artist himself and his spouse. It is not easy to do this, since Matisse deliberately makes the features of the characters schematic. But if you start to analyze the canvas more deeply, it becomes clear that not everything is so simple here. The artist interprets reality in a special way. The blue background is not just the color of the wall. It develops into an important symbol, becoming an important idea of ​​space as a whole. Blue is incredibly significant. He just fascinates all viewers. Our subconscious mind miraculously goes into the magical depths of the seas, to peace and quiet. This is a special source of life. It was from here that all living things originated. Green is very important. It symbolizes nature, fertility. In the center we see the tree of life, which personifies the whole life cycle for a long time. The figures of a man and a woman are also significant. They become a vivid embodiment of the feminine and masculine beginnings. To express a male artist uses vertical straight lines. For feminine, he uses gracefully curved lines that impress with incredible smoothness. This union is eternal. Thanks to him, a new life is born. The tree is depicted between them in order to symbolize life. The grille is made of different lines. It is she who becomes an unusual bridge between a woman and a man. There is no perspective on this picture. The artist depicts objects in a completely different way than they are in reality. For a painter, it’s not the things that matter, but the special relationships that arise between them. He is interested in age-old connections. The idea becomes universal and solid. Consciousness involuntarily goes to distant antiquity.